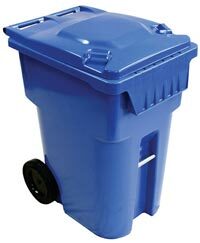 You may buy blue bins for recyclables and black bins for garbage, in 360 liter format, through the municipality. They are delivered directly to your home. The cost is 100 $ plus taxes per bin, including tax and delivery. Brown bins for compostable material are provided free of charge but remain municipal property. The municipality picks up a maximum of one (1) black bin (garbage) per adress and a maximum of two brown bins (compost) and two blue bins (recycling).